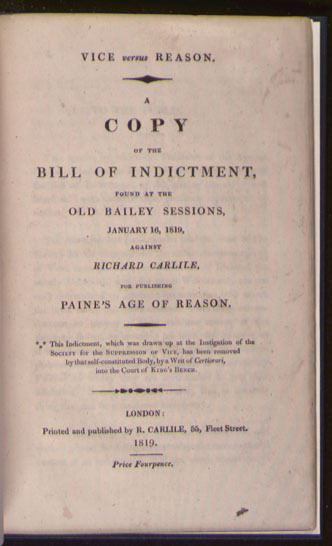 Vice Versus Reason: A Copy of the Bill of Indictment, Found at the Old Bailey Sessions, January 16, 1819, Against Richard Carlile, for Publishing Paine's Age of Reason. London: Printed and Published by R. Carlile, 1819. 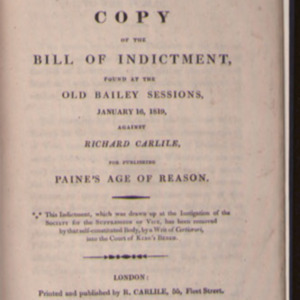 From the Richard Maass Collection of Thomas Paine. “Vice Versus Reason,” University of Virginia Library Online Exhibits, accessed April 25, 2019, https://explore.lib.virginia.edu/items/show/590.